It was 8 pm and another king was lying on the floor of my buddy’s 16-foot aluminum tiller rig. This was the third Chinook larger than 14 pounds to hit the deck within an hour and a half. The bronze bomber inhaled a red label herring, which was soaking in a mason jar of chartreuse Pautzke Fire Brine ten minutes earlier. My angling partner in crime Jeremiah quickly loaded another dyed herring into his Rhys Davis trolling head and sent the flasher and meat rig back down to 90 feet in the clear waters of Lake Huron’s Georgian Bay. I had just loaded up the rod on the port downrigger set at 70 feet when it began to bounce in the holder. Another Huron Chinook was engulfing the herring. We were about to add a 4th salmon to the meat locker. By the time the sun set at 9:15 we were on route to the cleaning station with a single limit of five Huron Kings and estatic. One of the Great Lakes, Lake Huron has received government plantings of Chinook since 1968. However, connected through a massive canal system to the St. Lawrence Seaway and ultimately the Atlantic Ocean, the shipping industry has brought Huron a mass of invasive species over the past two decades, which has taken a toll on the fishery. During the “heydays” of Huron salmon fishing mature Chinooks averaged 20+pounds and breached 30 pounds often. These West Coast transplants fed on massive numbers of an early established alien bait fish – the alewife. In the late 90’s, other invasive species, namely zebra mussels, quagga mussels and spiny water fleas found their way into the Huron food web and changes began to take place. As a result vital nutrients, planktons and invertebrates began to disappear from ecosystem. The food web began to crumble. By 2003, alewife numbers crashed and the millions of salmon throughout Huron began to pay the price for the lack of food. Gone were the days of mature Chinooks. Fish now averaged nine pounds and had a length of more than 30 inches. They looked like pike! Numbers throughout the lake dropped as the mass population of salmon couldn’t find food. By 2005, fisheries managers on both sides of Huron (Michigan and Ontario, Canada) began retrieving information from a mass marking program. Turns out, the majority of Huron salmon were naturally reproduced, with the greatest numbers being born in the pristine rivers along Ontario’s shoreline. And, huge numbers of annually stocked Chinook were adding to the huge population of starving salmon. Fortunately, fisheries managers adjusted the allotment of stocked fish on both sides of the border. A massive cutback exceeding 50% lake wide ensued. This caused a dramatic decline in the fishery. Charter ports in Michigan and Ontario closed. Meanwhile, reduced stocking and seven years of recuperation appears to be the remedy Huron needed. The fishery is improving. The past two summers have seen increases in healthy Chinook, which have adjusted to the absence of alewives. Chinook are finding other food sources, too, such as smelt, shiners, shad and other minnow species. These fish are not the 30-pound kings of the past, but are much healthier than the returning fish from 2003-09. Average three-year-olds this August are in the mid teens, a huge increase from eight years ago. Stocking cutbacks remain, but large percentages of wild fish in the system makes up for the declines to some extent. Fact remains, the fishery is in limbo with improvements in some areas while glaring deficiencies in others. No one knows for sure what the coming years will bring for the Huron salmon fishery. 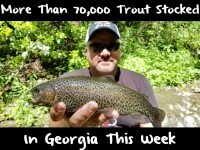 Nevertheless, we’ve been able to catch fish this year! When it comes to putting fish in the boat on this evolving fishery it becomes apparent that keying in on details is an advantage. I’ve salmon fished Huron since I was a baby. It’s my home water. I’ve seen the fishery go from boom to bust to back on its feet. Boxing kings in this current melting pot of variables means breaking the rules and thinking outside the box. Fewer Chinooks means your odds of trolling over good numbers of salmon have dropped. However, these salmon are hungry and aggressive, making biters out of fish that would normally be lookers! 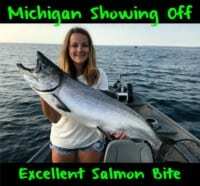 Great Lakes salmon trolling is fundamentally based on downrigger fishing and paying attention to preferred temperature below thermoclines throughout the lake. With low numbers of suitable baitfish, salmon now spend considerable amounts of time outside of preferred temps seeking baitfish in warmer and shallower waters than normal. To remain successful I adjust our patterns and approaches, searching for fish on the graph. My angling buddies and I fish Lake Ontario often and commonly find out the techniques that work there don’t work here. In Georgian Bay regulations state that anglers can only use one rod per person in the offshore fishery. I usually fish with a single guest. We rely on two baits, only. Nothing has turned more fish than Fire Brined meat. Whether it is Red Label Herring or Rhys Davis Anchovies this brined meat works wonders. We have been tinkering with the Fire Brine all year, taking the awesome liquid down to Lake Ontario and laying a severe beating on 30-pound kings. Here on Huron, Fire Brined meat has accounted for 90% of our catch over the past couple months. Chartreuse, blue and custom mixed green have been winners in this super clear water of Georgian Bay. We pair the meat up with Rhys Davis Anchovy Special trolling heads, trailed behind a Spin Doctor Flasher or Fish Flash Attractor on 25-pound Maxima fluorocarbon. Leads between the flasher and bait vary, but I’ve found that 30 inches is a staple for aggressive Chinooks. Once the fish begin to stage in near shore waters they become lazy and belly up to the bottom. For staging fish we tend to lengthen the distance of the leaders from 40 to 70 inches depending on the mood of the Kings. As I continue to fish the Fire Brine my angling buddies and I are constantly adjusting the exact process and mix. Here is the latest edition of our Great Lakes formula. Allow the mix to sit on the counter or on the “man cave” desk for an hour. After that, place the jar in the fridge on its side until the following day and the baits are ready to rock. These baits (if not fished) will have a fridge life of up to a week at least. This means anglers are wasting less bait once they have thawed bait out and not used them. 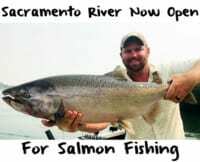 By the time this blog entry is posted, I will be busy chasing Huron Kings in our largest area salmon derby……chances are pretty good my trolling spread will be all FB’d meat!